Singer-songwriter Jewel, who is two weeks pregnant with her first child, was hospitalized after a crash with a fire truck Friday morning. Singer-songwriter Jewel, who is pregnant with her first child, was hospitalized for observation after an accident involving a fire truck Friday morning. Jewel, who is married to rodeo champion Ty Murray, escaped serious injury, according to the Stephenville Empire-Tribune. The couple owns a ranch near Stephenville. 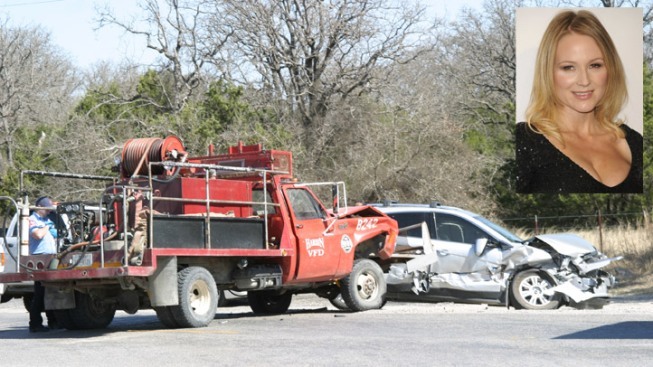 The two-vehicle crash involved Jewel's car and a Harbin Volunteer Fire Department fire/brush truck. The Empire-Tribune reports Erath County Commissioner Jim Pack was driving the truck on his way to a grass fire on US Highway 67, when the truck hit the car carrying Jewel on the passenger side. Pack's siren and lights were on, and the accident remains under investigation. "Jewel was hit by a fire truck this morning in Texas," her rep said in a statement. "The singer was taken to the hospital and current medical tests conducted indicate that she and the baby are doing fine." Jewel announced her pregnancy two months ago, and has since told reporters she's having a boy.